This is a popsicle card I made recently for an anniversary. It could easily be turned into a birthday or thank you card. I used the Summer Daydreams Collection from PhotoPlay #thinktoremember. I used the Multi Dot and Popsicles paper from the collection. I cut the twin popsicles using the Cricut Doodlecharms cartridge, p. 43, cut at 2 inches. I inked around the edges in a darker pink color to add some shading. I layered the popsicles onto a 2 inch polka dot circle, then onto a 2-1/2 inch circle. I added two die cut circles in pink and peach behind the larger circles, and added dimensionals behind the popsicles to attach them to the card. I used Stampin' Up! cardstock colors for the card, layering pieces, and circles in Flirty Flamingo, Peekaboo Peach, and Lemon Lime Twist. For the die cut circles, I used the new Dotted Circles Dies from Catherine Pooler Designs, plus a 1-1/2 inch punch to cut out the greeting. I stamped the "you're so sweet" greeting using markers to ink the stamp from the You're So Sweet stamp set by Stampin' Up! and stamped the "together" in lemon lime twist from the stamp set Crazy About You from Stampin' Up! (now retired). Finished card is 4-1/4 x 5-1/2 inches, top folding, with each of the colored and patterned paper layers cut 1/4 inch smaller than the previous layer. I added a couple brads from my stash that matched the colors pretty well! You could also use enamel dots or sequins, whatever you have on hand. 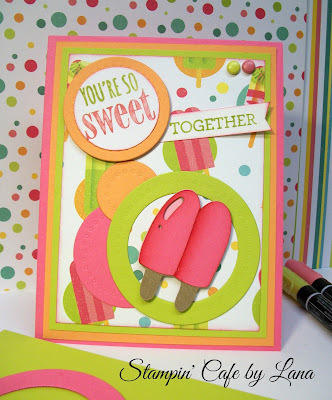 This makes a perfect summertime card for a lot of occasions with all the sherbet like colors!